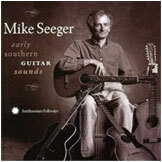 On 28 songs and tunes, Mike plays a variety of the guitar styles used in the rural South from about 1850 to 1930, on 25 different types of guitars. Featured are banjo-like styles, rags, blues, parlor and parlor-based styles, slide styles, and many accompaniment styles. Includes a 36-page booklet covering Southern guitar history, notes on songs and styles, and color photographs of many of the instruments used.